Why use $m_k$ to approximate $f_k$ in trust region method for optimization? 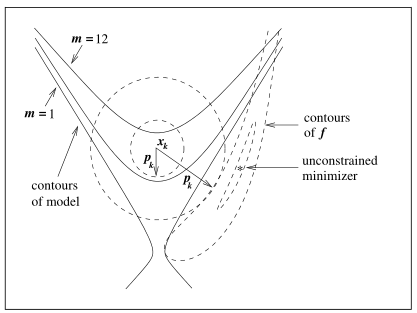 In the second algorithmic strategy, known as trust region, the information gathered about $f$ is used to construct a model function $m_k$ whose behavior near the current point $x_k$ is similar to that of the actual objective function $f$. we find the candidate step $p$ by approximately solving the following subproblem: $$\min_p ~~m_k(x_k + p)$$ where $x_k + p$ lies inside the trust region. I have a naive question to ask: Specifically, I understand how to approximate $f$ but not why: we can use Taylor expansion to approximate, but I do not understand why we need approximate at fist place? Is that because we have a simpler system (quadratic form) that we can solve? Note, the approximation (quadratic form) may not be convex, as shown in the example in book page 20. Yes, a quadratic approximation of the objective function is used, and updated/improved, as the optimization progresses. It is usually a simpler problem to solve than the original, and its solution doesn't require any (possibly long-running) evaluation of the actual objective function. But it's not entirely accurate, that's why the trust region is used to restrict the solution of the trust region problem to a region in which the quadratic approximation is accurate enough so that the actual objective function improves when the solution to the trust region problem is obtained. And if it doesn't improve enough, the trust region problem is re-solved using a smaller trust region. Note that in some cases, such as when the objective function can only be evaluated based on for instance the solution to some differential equations, there isn't even a closed form for the actual objective function, but a quadratic approximation can still be used. Note that steepest descent and gradient descent also use a quadratic approximation to the objective function, but with the Hessian (quadratic term) always being the identity matrix. Indeed, trust region approach can be used on steepest descent/gradient descent (well, a trust region gradient descent would be called trust region steepest descent), Quasi-Newton, and Newton, with exact or finite difference gradients. If BFGS Quasi-Newton method is used (damped if constrained), then each quadratic objective approximation can be convex. Using SR1 Quasi-Newton, or the actual Hessian, the quadratic objective approximation may or may not be convex. But each trust region problem does not need to be solved to global optimality, or even local optimality, and they will be bounded due to the trust region. Finally, note that trust regions can be used for optimization subproblems without the subproblem objective function necessarily being quadratic. You could use a rational approximation, or even a cubic (if you're ready to have some fun with 3rd order tensors). Not the answer you're looking for? Browse other questions tagged self-study optimization or ask your own question. Why are symmetric positive definite (SPD) matrices so important? What is a trust region reflective algorithm? Why logarithmic scale for hyper-parameter optimization? What optimization method does “survreg” use? Why not use the third derivative for numerical optimization? Is it important to have Hessian positive definite for trust region method optimization?